The choice of fluorochromes for a multicolour experiment at ICMS given the instrumentation available comes at three levels. Level One - if only three or four antigens are to be analysed it is possible to choose fluorochromes so that very little fluorochrome colour compensation is required. An example of Level One choice of fluorochromes would be CD3-FITC, CD4-APC and CD8-Pacific Blue. This 3 colour example is using fluorochromes that are used by all three lasers on the LSRII and Canto II, Blue, Red and violet in which only a small degree of compensation of FITC bleeding into APC may be required. The addition of an extra colour to make a four colour analysis would if PE, or PE-Cy5.5 or PE-Cy7 would require compensation with FITC and APC. Level Two - covers the use of 5-8 colour's which the ICMS's LSRII and Canto II can comfortably accomplish with a higher degree of compensation than the small applied at Level One. This would include the use of PE, PE-Cy5, PE-Cy5.5, PE-Cy7 and APC-Cy7 in addition to the fluorochromes mentioned in Level One. The analyser instrumentation at ICMS can be easily carry out 8 colour immunophenotyping if compensation beads are used. Level Three - covers the use of 9 or more colour's, where Pacific Orange, PE-Texas Red, APC-Cy5.5 and Qdot 605 can be used if antibodies can be found that are directly or indirectly conjugated and biotin labelled antibodies. These require more antigens that are highly expressed as these fluorochromes bar the Qdot are inefficient and ineffective with antigens of low density e.g. Pacific Orange would require to be used to label CD45. The LSRII and FACSAria I cell sorter is required for Level Three experiments. The above compensation is carried out using single colour compensation tubes using BD Compensation Beads. This is covered in detail in the Compensation Section. This automated calculation of the compensation matrix is more accurate than manually setting the compensation with cells. This is due to the influence of autofluorescence on the algorithm employed in such calculations. Any variation in autofluorescence causes miscalculation of the matrix giving inconsistent results. Compensation Beads have a negative population of a consistent background fluorescence with a relatively high positive peak. This is very useful for studies in which cells have a low antigen density for particular antigens e.g. 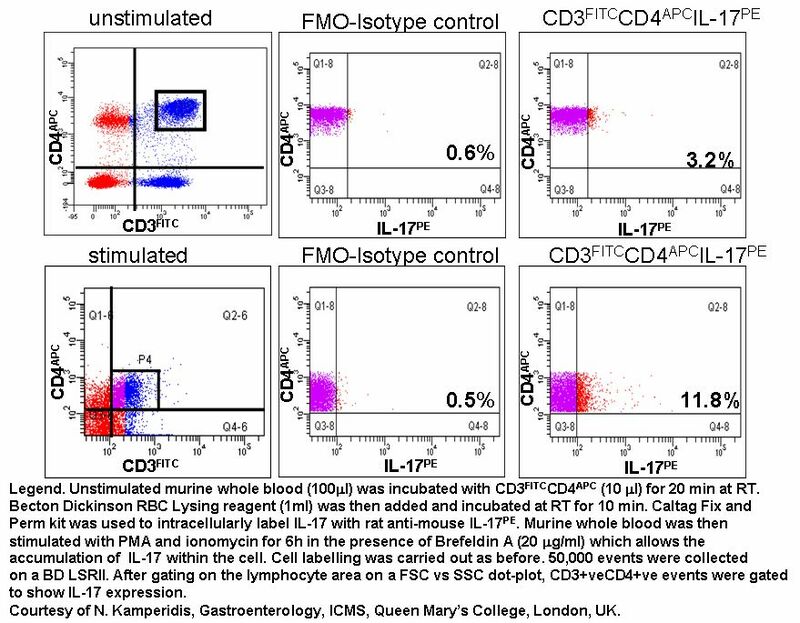 CD25, FoxP3 and IL-17. These beads actually inform the researcher that the antibody and fluorochrome tested is functional under experimental conditions. 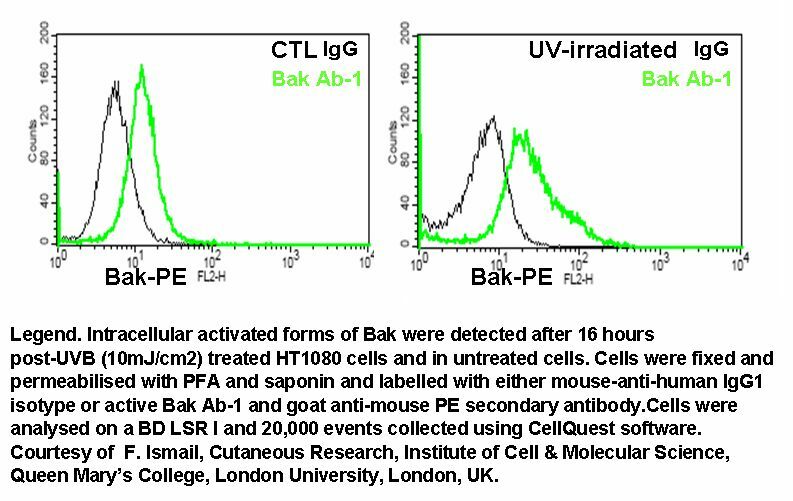 Achievable fluorescence signals from such beads is comparable to that found on lymphocytes but not larger cells such as dendritic and tumour cells. The positive bead population has to be higher than those under test. Under circumstances were the test fluorescence is higher than the positive peak of the compensation beads researchers should use a mixture of cells and negative beads then the computed matrix can compensate such samples correctly by gating on cells for the signal and Negative beads for the autofluorescence part of the calculations. Failing this, it is relatively simple to bind antibodies covalently to carboxylated latex beads to a higher density by using 6um beads from Polyscience. There would in this experiment no requirement for isotype controls as the populations of cells of interest are very separate. However in experiments were activation markers are present such as CD69 and CD25, isotype controls are useful if the all reagents have the same fluorochrome/protein ratio (F/P ratio), this can be achieved if the reagents are bought from the same company, see section below for more information. Researchers would also run single colour BD compensation controls tubes for each antibody used for setting up the protocol. These bead compensation samples are only required to be run again if the antibody lots are changed, the CST bead lot is changed or the engineer services the instrument. 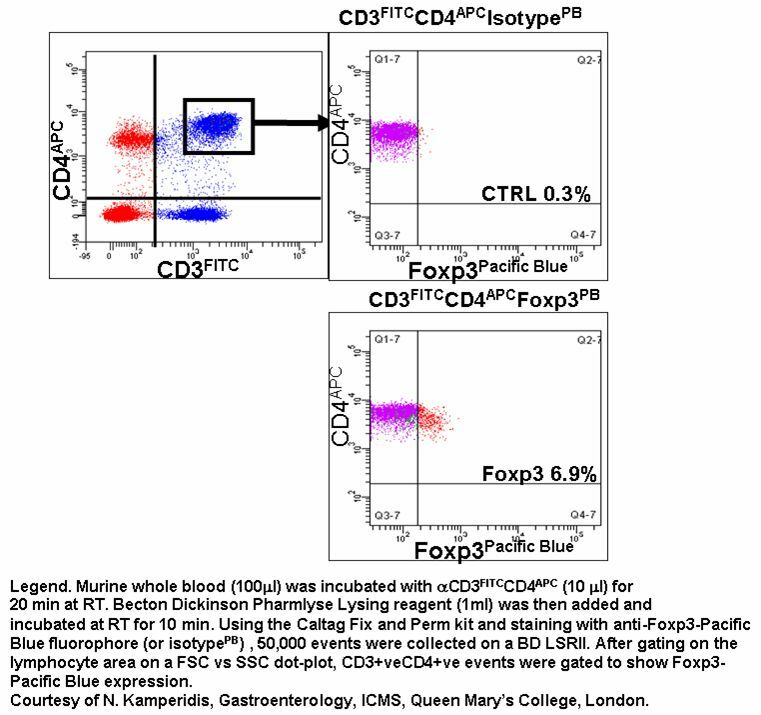 For those flow cytometric experiments were activation markers are to be measure such as CD69 and CD25 the use of isotype controls or better still cold antibody experiments are necessary. Multi-parameter experiments using for example CD3-FITC, CD4-PerCP, CD8-Pacific Blue and CD25-PE it is necessary to run FMO tubes. eg, see below. 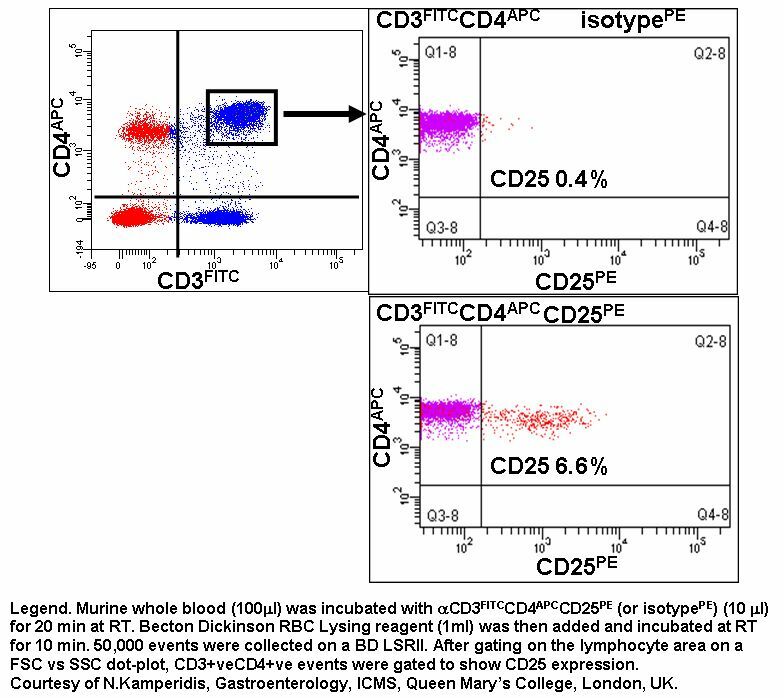 Another 2 tubes are required to analyse CD25 expression correctly. The 2 tubes must be first be incubated with blocking antibody with no fluorescent conjugate present this will block Fc receptor and other non-specific binding.The other antibodies are then incubated with the cells in both tubes except that one tube has CD25-PE present and the other does not. If using unlabelled antibodies the secondary fluorescent conjugate can then be used with the primary mcab in question and a matching subclass antibody for the isotype control. This is a better use of isotype controls as the same fluorescent conjugate is used in the test and control tubes, see example. Compensation with anticoagulant protein annexin V can be achieved by labelling apoptotic cells with just the annexin V reagent. A better method would be to bind the annexin V to Polysciences inc carboxylated beads and run these in conjunction with unlabelled beads from the same source. Compensation with fluorescent proteins can be achieved by binding the fluorescent protein of choice to Polysciences inc carboxylated beads and run these in conjunction with unlabelled beads from the same source. Fluorescent dyes of choice can be loaded into cells individually and run in conjuction with negative fluorescent latex beads and compensation achieved by the Becton Dickinson automated compensation matrix available on the flow cuytometers at the Blizard ICMS.